Wrapped around kelp in Morro Bay, California. Sea otters (Enhydra lutris) are marine mammals. They live along the Pacific coast of North America. 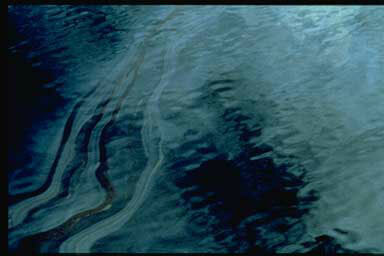 Their historic range included shallow waters of the Bering Strait. It also included Kamchatka, and as far south as Japan. Sea otters have about 26,000 to 165,000 hairs per square centimeters of skin. They have a rich fur for which humans hunted them almost to extinction. By the time the 1911 Fur Seal Treaty gave them protection, so few sea otters remained that the fur trade had become unprofitable. 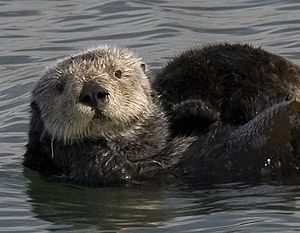 Sea otters eat shellfish and other invertebrates (especially clams, abalone, and sea urchins). The otters usually carry a favourite rock in their paws or in a pouch under their forearm. They use it to smash shells open. This makes them one of the few animals that use tools. They grow to 1.0 to 1.5 m (3.3 to 4.9 ft) in length and weigh 30 kg (66 lb). Although once near extinction, they have begun to spread again, from small populations in California and Alaska. Sea otters are one of the smallest mammals in the ocean. Mother sea otter with rare twin pups, Morro Bay, California. Sea otter twin births are rare, and the high demands on the mother usually result in one pup being abandoned. Sleeping sea otters holding paws, photographed at the Vancouver Aquarium, Vancouver, British Columbia, Canada. Note the high buoyancy of the animals' bodies. A mother floats with her pup on her chest. Georg Steller wrote, "They embrace their young with an affection that is scarcely credible." Sea otter nursing pup. California has almost 3,000 sea otters, descendants of about 50 individuals discovered in 1938. Sea otter Facts for Kids. Kiddle Encyclopedia.